Lovely final vignette Nicole, but please don’t enter me in the giveaway Rita.. The copy I won earlier in the tour arrived on my doorstep this week and the cover is even more gorgeous in person than in the photos. Very much looking forward to reading it. Great way of finishing the tour! I am glad you enjoyed it. Thank you for taking part in the tour! What a wonderful vignette. It just finished the story off so well! They are my favourite minor characters and I really enjoyed reading their story. Thank you so much. Please don’t enter me in the giveaway as I already have this lovely book. Thank you for stopping by, Glynis! I am so happy you won a copy, and thank you for supporting the tour. What a lovely vignette. I have always loved the relationship between the Gardiners in the stories I’ve read and am so happy to see them as the main focus in this story. Thank you for hosting, Rita and thank you for setting up this lovely tour! I have enjoyed chatting with everyone so much, and I have been humbled and warmed by all of the responses. Who knew that everyone love the Gardiners so much? Merry Christmas, everyone, and good luck in the last drawing! This is a very good story. Thank you for the pleasure. The pleasure was mine, Betty. I am glad you enjoyed it! That was an exquisite little gem of a vignette! If I don’t win, I will be buying it! Thank you! I love adding short vignettes. They may not flow in the proper story line, but they are so much fun! Best of luck to you, Carole! Ahhhh, that was a sweet vignette. I’m so happy for their Christmas present. I am glad it made you smile, Sophia. Thank you for being a part of the tour! 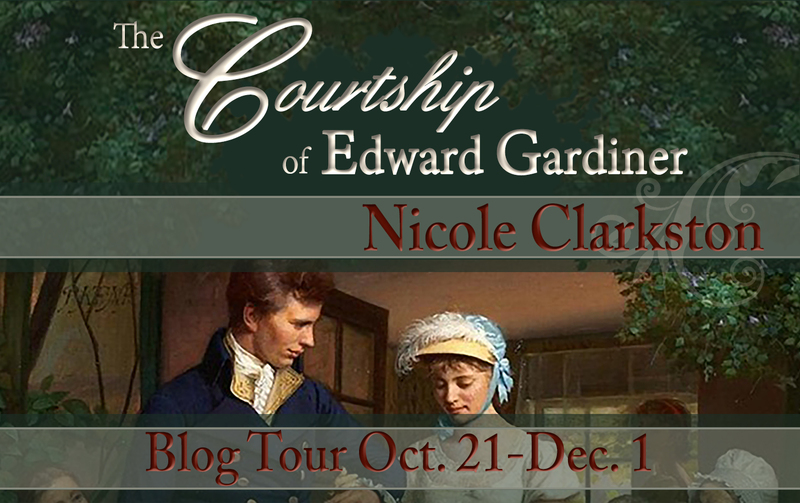 Can’t believe this blog tour is coming to an end… thanks for sharing so many wonderful excerpts along the way! I can’t wait to read it! I had so much fun! It was a pleasure to chat with everyone. Happy reading and Merry Christmas! Thus book sounds so lovely, I’d really like to read it! Good luck in the giveaway, Kirsten! What an awesome vignette. I love them, too, Rita! 🙂 Christmas is my favorite time of year and this was perfect for setting the mood. Thank you, Nicole. Glad you thought the cover was better ‘in person’, Anji! I loved the vignette – the Christmas tie-in is wonderfully appropriate for the season 🙂 . This blog tour has been fun! Delightful! Absolutely delightful to see the Gardiners,Bennets and Mr Fairbanks all enjoying their first Christmas together,acid to think that in under a year,there would be another happy addition to the family. Thanks to all concerned for this warm and life affirming snapshot which was lovely to read,especially at this time of year. I enjoyed this story and also posted a review.